WordPress has lots of version from 25-May-2003 till now the latest version of word press is WordPress 5.0. The releasing date of WordPress 5.0 version is 6 December 2018 to the public. This is an updated version of WordPress 4.9. If you want to develop the website in WordPress contact to with ViGRO Technology. The main focus of this version released was improvements in the block editor. It is basically a blockchain editor. This is a new interface for adding, manipulating and editing the content. By using this version people can easily create a flexible content layout with the help of blockchain based UI. All types of web page components are available as modular blocks, this means you can be used from a unified block menu, image gallery dropped anywhere on a webpage and directly edit to the web page as per user requirements. This is a very good system for both users and develops if you want to develop WordPress website designing contact to us. This WordPress version 5.0 gives lots of opportunities to create custom web page or website. How you will update this WordPress version 5.0? You can do these things with the help of a plugin. Download the Gutenberg plugin, which you install very easily or simply when you login in your dashboard on top you can see a button of update this version, when you click on this button update this version then you can easily use this version. Gutenberg plug-in is available to update your previous version. What you have to do before updating this version? Take a backup of the website: – The very important step before update this version 5.0 takes a backup of your website. There are many backup options is available on your dashboard or you may contact to hosting provider to take backup of your website. What are the main Changements in WordPress version 5.0? The main change has come to the editing the word press theme. The new block editor did not change the way to representing the content in the front of visitors. What it will do is let you are inserting any type of multimedia in the snap and it rearrange into your content. Custom WordPress website designing is an art in this version 5.0. Improvement in word press reset API:- The reset API helps to web developers to create more features and functionality rich products by creating it easier to send and transfer date from your website. Advance Page builder tools:- There is a lot of page builder tool that you can use while creating the page. Tons of blocks available automatically or by default with many to come: – Heading, text, image, gallery, video, and audio, columns with nested blocks, files, and code. What is Advantage of version WordPress 5.0? Easy to Use: – It is very simple because the shape divider block is based on this version editor. In there, some animated gif is available to show that how to use the shape divider block to adding, editing a shape above which is exiting right now. 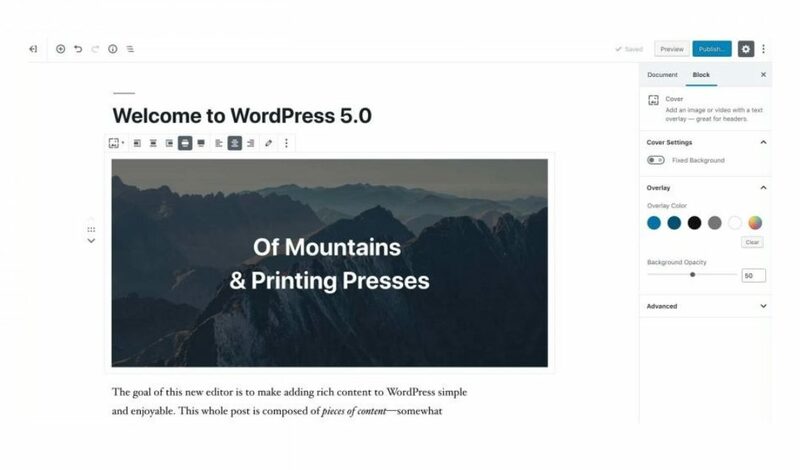 Easy to create: – Now can easily create a custom look of your website with the help of this WordPress version 5.0 because of their new blockchain editor functionality. How the previous version of 4.9 is different from WordPress 5.0? WordPress 4.9 version released on 14 November 2017 in the version you can save and schedule theme change. In 4.9 versions, when you make any change to a theme using the customizer, there is one main option to save your change as a draft with without making theme live on the internet. These features help to allow sharing the preview of change with a URL. You may share this link to your client or team and they can able to see the changement of the website without live. In this version, 4.9 was media widget including text, audio, video and image, and a new gallery widget. It helps to create you a gallery and add it to widget ready area. Now in WordPress 5.0, it is only on focus on blockchain editor to edit a web page. The second thing is a new gallery widget including rich text, image, and video. It helps to create a custom gallery and add is any widget. The Version 4.9 improved code editing experience in them we see an enhanced code editor while doing change in coding like custom CSS. Why the WordPress is popular in the world? One of the important region why people like to WordPress website designing and why is so popular in all over the world as a blogging platform to something else, in which you can add lots of images, video, written content. The main region, why it is more popular with web designers and developers because as a way of providing their customer great, awesome content management system. It is an open source (Content management source) which means that there are lots of developers in the world regularly working on improving its features and functionally. It also gives an update after some time with lots of new features. Beings as an open source have lots of benefits; one main benefit is people are constantly giving suggestions to improve this platform, their problem, securities problem etc. Summary: Now we can use a new version WordPress 5.0 with some excellent new functionality. There is new editor introduced and the common name of the editor is Gutenberg. With the help, new editor people can easily create a website or web pages. If you want to develop a custom website in WordPress contact us.